Summer is here and in case you missed the spring cleaning memo, it’s not too late to grab some rubber gloves. While some areas your home obviously need routine cleaning, other areas are a little less clear and they may not be scrubbed and scoured for extended periods. The infographic below from HappyCleans addresses all the different areas of the house and advises on how often they should be cleaned. Fan vents are one area that might be missed on a routine clean. Fan vents are great at collecting dust, pollen and other allergens and the build-up can even clog the vents. You should on a monthly basis remove the cover and vacuum with a crevice tool and also soak it in warm and soapy water before replacing. The fireplace is another area that we can forget about – but it does need attention every so often. The best time to give it a clean is after a lot of use in winter. Give the firebox (where the fire is built) a clean after every use, otherwise ash will spread throughout the room if ignored. Another item you may not have thought of cleaning is your mattress. 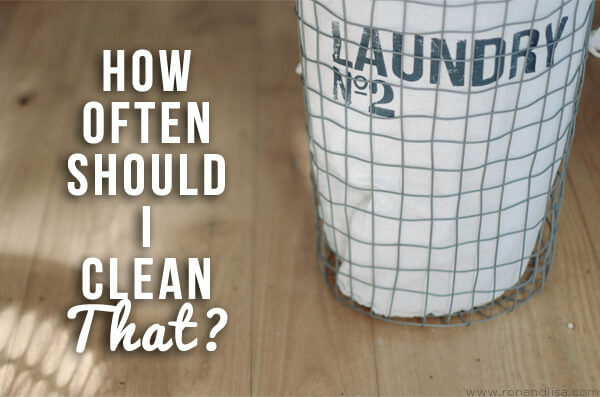 Cleaning just your sheets and making your bed isn’t always enough. Your mattress also needs a clean every 2 months or so just to kill any bacteria. Find out more now. Oh, ignore the chlorine bleach suggestion which is a big no-no. Opt for baking soda or a non-chlorine bleach alternative instead like OXO-Bright.